Sidewalk style café offers a nice selection of tapas and wines, served by a patient and knowledgeable staff. : Adults react to Café Madrid much like kids react to any fast food restaurant with a play area---it's nothing but fun. 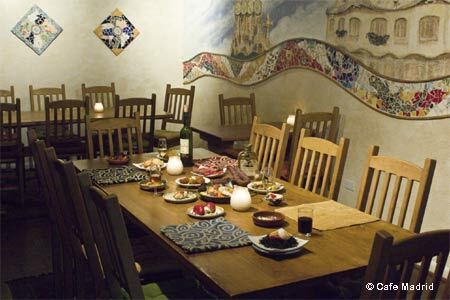 Diners are offered a choice of more than three dozen Spanish tapas, an assortment of which may constitute a meal. You can take the traditional route and accompany your meal with a glass of sherry, or choose from the selection of wines; the patient, knowledgeable staff will ably assist. We've enjoyed the plump little mussels vinaigrette, the potato-filled omelet and the zesty chorizo in a garlic wine sauce. Paella, a house specialty, is available tapas size or as an entrée portion. Regardless of your selection, be sure to order a side dish of aïoli and end with the lightly sweet flan. Café Madrid is a good destination for a leisurely Saturday lunch with friends.